Building a room addition onto your home is a great way to gain finished living space, and enhance the beauty and stateliness of your home if done right. Regardless if you’re building a family room, master bedroom suite, bathroom, or adding a second floor, a room addition is often a great economical alternative to moving to another larger home. However, before jumping into a DIY room addition project, it is important to understand that such an endeavor is a large undertaking and takes careful planning and considerations. 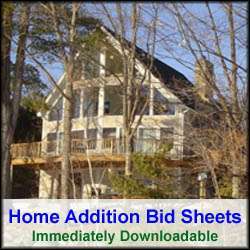 Moreover, it is essential to map out on paper the size of the room addition, where it will tie into your existing home, and the amenities you want to incorporate into it, so that you can come up with an accurate DIY room addition price estimate. 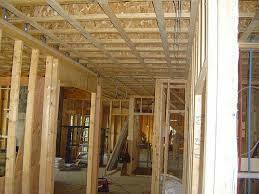 Bedroom and family room additions are the most economical to build relative to other types of room additions. Typically these types of room additions do not include plumbing, thus saving on plumbing costs and bathroom/kitchen appliances. For bedroom or family room diy home addition cost estimates, expect to pay anywhere from $80 to $130 per square foot for building a bedroom or family room addition. Kitchen and bathroom additions are very expensive to add onto your home due to the fact that they require plumbing, cabinetry, countertops, appliances, and in the case of bathrooms, plumbing fixtures. For bathroom or kitchen addition diy home addition price estimates, expect a cost of anywhere from $100 to $200 per square foot for adding a bathroom or kitchen addition onto your home. Adding a second story addition onto your home is also a very expensive endeavor, in part due to the fact of having to remove the home’s existing roof and for having to relocate the family for a period of time. A second story addition is also a huge diy home construction project, so don’t tackle this type of project unless you have prior experience in the home construction industry. For a typical diy room addition price estimate on a second floor addition, expect a cost of anywhere from $100 to $150 per square foot. 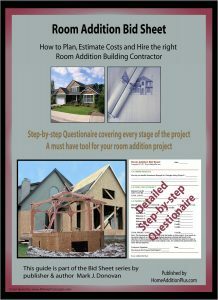 For accurate diy room addition price estimates you’ll need a complete set of blueprints and bill of materials (BOM) costed out. You can provide your BOM to various home improvement centers where they can work up formal quotes for you. Don’t forget to ask them for contractor pricing, which can save you typically 10-20% on your material costs. Often on a room addition project they’ll give diy homeowners the same discounts they give general contractors. Besides coming up with your diy room addition price estimate for building the room addition, you’ll also want to determine your increased monthly operating costs for owning more finished living space. Both you’re property taxes and utility costs will go up due to the increase in finished living space associated with the room addition. Make sure your monthly home operating budget will be able to handle these higher costs before committing to building a room addition.